The first thing that I should say is that I borrowed Bio Shock today. 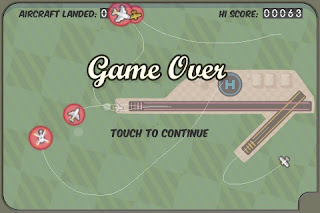 That I got in and played Flight Control on the touch rather than try a modern day classic on the Playstation says a lot. It's addictive in the classic sense. Top down view of an airport, guide the planes and helicopters into land. Big planes on big runway, little planes to the little runway and helicopters to the helipad. Couldn't be simpler. Right? Except it swiftly descends into a frantic attempt to stop the planes crashing into each other. Of course the Ledgers have been competing at lunch. We would wouldn't we? AT currently leads with 89, I think, so 90 is the target. I currently lag behind on 63. Sad face. It is so addictive and probably the best example of the touch screen being put to good use in a gaming sense that I've seen. And it cost 59 pence. Awesome.